If you are here to check us out, welcome. Blog Appetit features local San Francisco Bay area foods and resources, a wide array of international and American regional recipes and more. Plus lots of stories, photos and recipes from my visits to Argentina, China, Portugal, Spain, Eastern Europe, France, Vietnam and more. Because of my freelance writing, I also have a lot of recipes for Jewish food from around the world. I hope you will take a stroll through the categories and see all the recipes and stories Blog Appetit has to offer. Please take a minute and leave a comment below with the name and link of your blog and perhaps a link to a favorite post of yours. Watch for my upcoming event: Eating on a Jet Plane -- recipes, tips and tricks for bringing your own meals when you travel. If you would like to be notified when the event is scheduled, leave a comment or send me an email through my profile. Here's the latest adaption of my recipe for cioppino -- the real San Francisco treat. This recipe was supposedly developed by immigrant Italian fishermen early in the 20th century using what they had caught that day. It remains a popular offering at Fisherman's Wharf restaurants and food stalls. Heat oil in a large soup pot, add onions, saute until beginning to wilt. Add garlic, saute until slightly golden, add celery, carrots and fennel. Saute until beginning to soften. Stir well. Roughly chop tomatoes and add into the pot with their juices and the tomato paste. Stir well to combine and then add wine, stock and potatoes. Cover and cook, stirring occasionally. When potatoes are almost soft, taste and add salt, black pepper, oregano and red pepper flakes. About 10 minutes before serving, add clams to pot, adding more fish broth if needed. Cover. Three minutes later add the halibut chunks. Cover. Two minutes later add the crab and shrimp, mixing well. Add some fish broth if the mixture needs thinning. Cover. Raise the heat if needed to keep at a simmer. Simmer for 5 minutes or until the clams open and the shrimp and fish cook. Taste to correct seasoning if needed. Serve immediately in bowls with chopped basil and fennel fronds to garnish. 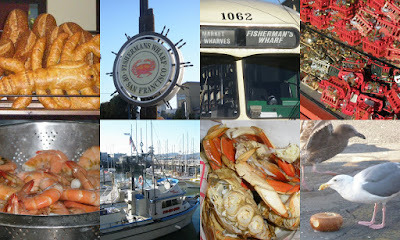 About the photos: A collage of my photos of San Francisco's Fisherman's Wharf (the second most popular tourist destination in the state of California) and a bowl of my cioppino. Welcome is written in English, Spanish, Vietnamese and Hungarian. Oh wow, that looks so good! I am glad that you were one of the random blogs toady. I enjoyed my visit, food looks awesome. That cioppino looks so good! I haven't had it in a very long time! Congrats on being one of the random blogs! YAY! Glad you all liked the recipe and photo. Thanks for checking out Blog Appetit. I hope you'll come back. JennDZ thanks so much for organzing the Foodie Blog Roll. I try to always check out the blogs you feature and have found quite a few I really enjoy.